During her learning experience with Tahoe, Vicky established a relationship with the Texas Parks and Wildlife. They were so impressed with the way she had been caring for Tahoe that when the need came to place a male cougar, they called upon her to help. Ranger had been kept in an enclosed 6′ x 10′ barn with no windows and no means of fresh air. The barn was covered in feces and there was no drinking water available. When the Game Warden first saw him, he was up in the rafters keeping away from the dirty floor. The first thing Vicky did was take him to the vet. Ranger was underweight and had liver and kidney problems. His poor health was related to having an improper diet of regular canned cat food. With a proper diet Vicky was able to nurse him back to health. 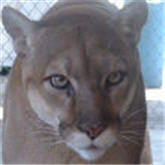 When Ranger was younger, he had crossed eyes which corrected themselves as he got older. He had a commanding aura about himself once he reached maturity. 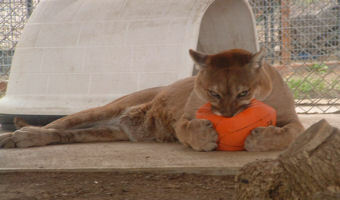 But he still loved to play, especially with basketballs. He made a very distinctive sound, like that of a small dog bark. 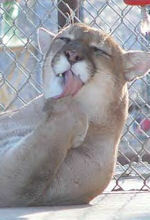 Ranger shared an enclosure with Tahoe, his loving companion, for 12 years. The two cougars were inseparable and doted on each other like an old, married couple. Tragically, we lost Ranger on April 6, 2006 to pneumonia. We miss him dearly, but he will forever be in our hearts.